Published: March 11, 2013 at 05:16 p.m. Updated: March 12, 2013 at 02:04 a.m. It wasn't so long ago that the NFC West was the laughingstock of the NFL. Now it's home to the best arms race -- and the best budding rivalry -- in the entire league. 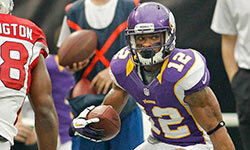 The Seattle Seahawks made a big, bold trade for a dynamic playmaker in Percy Harvin on Monday. The Seahawks gave up big-time resources in draft picks and likely a future contract to get it done. By the end of business Monday, the San Francisco 49ers responded by agreeing to send a sixth-round pick to the Baltimore Ravens for Anquan Boldin. These are very different types of moves. The Seahawks are betting big on Harvin's future as the biggest threat for Russell Wilson in the coming years. Boldin, on the other hand, is a one-year gambit. A move to put the 49ers over the top. Boldin will earn $6 million in 2013, but he will be a 33-year-old player in October whose best days are behind him. The odds on Boldin ever dominating again like he did in the postseason for the Ravens are slim. The 49ers, who still have 14 draft picks in April, are betting they can squeeze one more productive year out of Boldin. He helps give them a physical presence in the red zone. Boldin may not be part of this rivalry for long, but the trade for him is typical for the emerging power division in the NFL. With all due respect to the Atlanta Falcons, the 49ers and the Seahawks were the two best NFC teams by the end of 2012. Jim Harbaugh and Pete Carroll are both bold play-callers that attack the game differently than many of their coaching counterparts. (Carroll more on defense; Harbaugh more on offense.) The same is true for how they attack the offseason. They go for it. These teams aren't just good; they are interesting. The presence of Russell Wilson and Colin Kaepernick at the helms of both squads should ensure this is a rivalry that will endure this decade. These are two teams that are still building around both young quarterbacks. Harbaugh and Carroll know that standing pat doesn't work in the NFL. The rest of the NFC should take notice.